The Big Four global audit firms are often brought to the courthouse, but rarely go to trial. If the truth can only come out in open court, the largest global public accounting firms are successful at making sure it gets buried and then sealed forever. When was the last time we saw one of the Big Four firms — Deloitte, EY, KPMG, or PricewaterhouseCoopers (PwC) — defend its audits in the United States in open court? There’ve been a few big cases that have come close. Deloitte was scheduled to stand trial for its role in the failure of massive financial crisis mortgage origination fraud Taylor Bean & Whitaker. The parties settled two weeks before the trail was scheduled to start. PwC was ready to defend itself for its part in the failure and fraud at SemGroup. But that case, too, settled shortly before the parties were supposed to gather in Tulsa last August. In both cases the settlements are confidential, sealed by the court even though both failures resulted in bankruptcies. Barring a last minute settlement one Big Four non-audit case is scheduled to go to trial in Federal Court in California on March 30, 2015. It’s been a long time, more than seven years, getting to this point. Campbell v. PwC is about overtime, which the largest firms do not pay their unlicensed audit associates regardless of state or federal law. This group of plaintiffs says California law requires it. In a recent pre-trial statement filed with the court, the plaintiffs reveal “PwC employed many class members as Attest (Audit) Associates even though they had not passed, and many have failed, the Uniform CPA Examination, which is intended to demonstrate (by a passing grade) entry-level knowledge of the accounting profession.” Also, “In assigning job duties to Attest Associates, PwC did not consider whether they had failed the Uniform CPA Examination.” PwC is scheduled to file their own pre-trial statement today. How can PwC explain the assignment of audit work to unlicensed audit associates to perform their jobs under minimal supervision without considering whether the associates have failed the CPA exam? The Public Company Accounting Oversight Board (PCAOB), the SEC, PwC’s audit clients, and investors in shares of PwC’s audit clients should find that interesting and very worrisome. The PCAOB says that audit opinions in 85 of the 219 audits selected in its 2013 cycle of inspections of public company audits by the largest four US firms’ should not have been issued. PCAOB Chairman James Doty emphasized this point in a speech at the Exchequer Club in Washington, DC on November 19. Will the SEC act to enforce this? How can the large firms insure audit quality when they claim in overtime litigation that unlicensed audit staff with limited or no experience and many of whom have failed the CPA exam, are working under minimal supervision while carrying out their work? PwC charges its audit clients for the hours worked by its unlicensed Attest Associates. Plaintiff Sarah Sobek, for example, was billed out to clients at $157.00/hour as a new Attest Associate in the Sacramento office. Based on a 40-hour work week, PwC calculated in April 2003 that it paid Sobek $20.19/hour. PwC’s calculations for other class members are available to the public now. PwC’s partners are paid a portion of the firm’s profits. In 2014, the firm reported US revenues of $11,274,000,000, 41% of which was attributed to its assurance practice. The class in this case is defined as unlicensed Attest Associates who were employed by PwC in California for at least one day between October 27, 2002 and July 23, 2008. There are 1944 of them. More than 50% of the class members were no longer employed by PwC as of October 14, 2008. 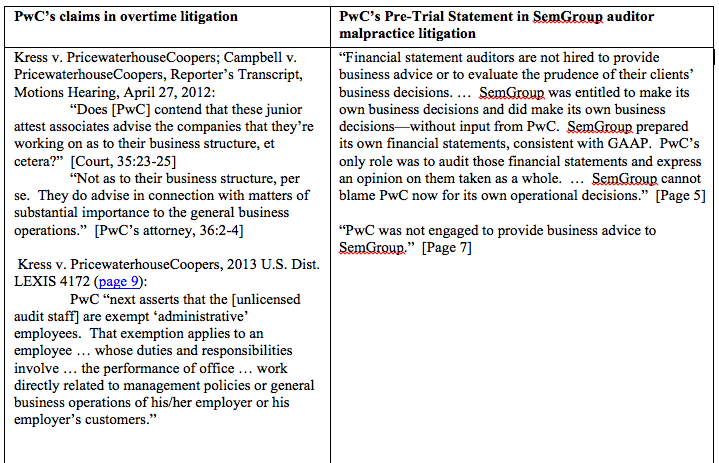 The position PwC has taken in the overtime litigation contradicts positions PwC has taken in other matters, such as SemGroup, the auditor malpractice case it recently settled. (That case sought actual damages of $1.1 billion plus punitive damages). So why is PwC still fighting the Campbell case? The amount claimed by the plaintiffs, documented in the pre-trial statement, is a little less than $39 million. That’s probably the budget for Starbucks, Saint-Émilion and steak dinners for the PwC San Francisco and Palo Alto partners alone on an annual basis. A jury verdict in favor of the plaintiffs would not necessarily include an injunctive order for PwC to start paying overtime to all of its California unlicensed audit associates. Neither of the Campbell class representatives (Campbell and Sobek) still work for PwC and that may preclude such an explicit order. So there’s no upside to getting a jury verdict in favor of PwC instead of a settlement except saving some portion of the $39 million. The explicit risk of a trial is that testimony by PwC executives like US Chairman Bob Moritz and Global Chairman Dennis Nally (both executives are on the Campbell witness list) will be embarrassing, incriminating and could even could force a complete change in the firms business model in California and nationally. Such a change would have a ripple effect on all of the large firms nationally given size of all of the firms’ California practices and difficulty of avoiding having California associates work in other states where overtime may or may not be required and having non-California based associates work in California. PwC has also lost all of its motions to dismiss in the Colonial Bank case and a trial for its role as auditor of that crisis-era fraud and failure is more than remotely possible. The Colonial Bank case is tied closely to the Taylor Bean & Whitaker (TBW) case against Deloitte. In addition to the FDIC’s claims against PwC for Colonial’s failure, the lawyer who extracted the sealed settlement from Deloitte for TBW (the original claim was for $7 billion) is also suing PwC on behalf of the TBW bankruptcy trustee. I’ve given advice to PwC in the past. They don’t acknowledge it and it doesn’t appear they ever act on it. I’d love to see a trial, in person, in this case. But, let’s be practical. PwC has a lot of other bigger things to worry about. If I were PwC, I’d settle. Thanks to Alexis Goldstein and Mark Buchanan.